Last November, the National Complete Streets Coalition released a new and improved policy framework for grading Complete Streets policies. Our revamped Elements of a Complete Streets Policy raises the bar by calling for stronger commitments to both equity and implementation (see Complete Streets Month). To celebrate the new framework, this year we’re highlighting 12 of the best Complete Streets initiatives, projects, and champions around the country in lieu of our typical annual Best Complete Streets Policies report. In 2005, 35 communities had adopted Complete Streets policies. Today, 1,348 Complete Streets policies have been passed in communities across the United States; in rural areas, small towns, mid-sized suburbs, and big cities. 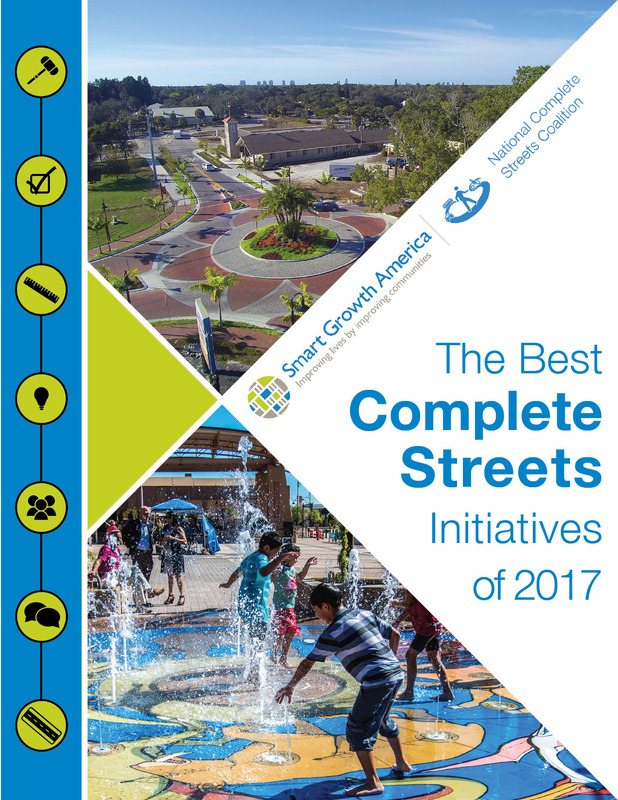 The Best Complete Streets Initiatives of 2017, released by the National Complete Streets Coalition, celebrates all of these accomplishments as well as the 12 communities that have already begun to set an example for Complete Streets implementation and equity. Congratulations again to all the communities highlighted in the report and jurisdictions that passed Complete Streets policies in 2017! We look forward to working with you to put these policies into action, and with new communities to pass more Complete Streets policies in years to come.